What Is the Real Reason Behind Finance Minister Kudrin's Resignation? Alexei Kudrin initiated his resignation himself, but it was Putin who made the principled decision to sacrifice him. Knowing the mood of his finance minister, Putin did not keep him informed about the proposed power structure that would follow the elections, and probably did not make too big a push to keep him as his key player. Kudrin’s resignation was certainly no ordinary event; it was a herald of fundamental change in the policy of Vladimir Putin. The key elements of Putin’s policy in the 2000s were, first, a focus on a center-oriented and authoritarian style of governance in politics; second, the dominance of the state and state officials over business, which is seen as a junior partner and a client in the economy; and third, a responsible macroeconomic policy. That three-part policy took its final shape during Putin’s second presidential term in 2004-2008, when Alexei Kudrin played an integral role in implementing the third element. He had Putin’s trust, as well as veto power in his area of competence. 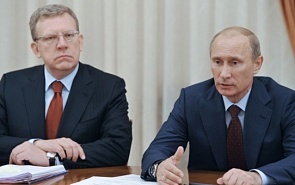 Kudrin ensured Putin’s authoritarianism through financial policy. The decline of that political doctrine became apparent even before Kudrin’s resignation, back in 2009, when the government decided to dramatically increase spending to help the economy weather during the economic and financial crises. Budget expenses, which accounted for 16% of GDP in the mid-2000s, grew to 18% in 2007 and 21% in 2009. This seemed like an emergency measure in 2009-2010, but after that, there were two options: either reduce direct assistance to the economy, encouraging growth based on state allocations and creating reforms to help the economy find new factors and sources of growth, or continue to implement the paternalist doctrine, which would allow the state to remain in charge but called for a dramatic increase in state spending. In the first half of 2011, Kudrin hinted broadly more than once that only the former option was acceptable. He also fairly openly took upon himself the role of ideologue of this policy. He probably thought that Putin could use his third and fourth presidential terms (which would effectively be his fourth and fifth terms in power) to implement the reforms that were on his agenda during his first term (2000-2004). The announcement that Dmitry Medvedev is likely to become Russia’s next prime minister has eliminated this possibility. Medvedev may speak like a liberal, but his qualities as a human being, his managerial skills and economic competence leave no chance for the pro-reform scenario. This scenario is further doomed because Medvedev has been instructed to lead the United Russia election list. This means that the choice has been made in favor of the old and rather primitive political structure. As a result, the legitimacy of the upcoming elections in the eyes of the people will be slim, which will hinder the government’s ability to implement complex reforms and make unpopular decisions. With Medvedev as prime minister, Kudrin, as an element of the new structure, would have been unable to deal directly with the real decision-maker, Putin. In fact, in that structure Kudrin would not even have veto power in his area of competence. His role would have been greatly diminished. Alexei Kudrin initiated his resignation himself, but it was Putin who made the principled decision to sacrifice him. Knowing the mood of his finance minister, Putin did not keep him informed about the proposed power structure that would follow the elections, and probably did not make too big a push to keep him as his key player. Putin made some appeasing statements when Kudrin resigned, but it was announced soon afterwards that he would also have to leave the other posts in which he had served after quitting as finance minister. Since the announcement was made after a personal meeting between Kudrin and Medvedev, this may mean that it was Kudrin who refused to remain on the team as a bench warmer. On the other hand, it's possible that Kudrin did not meet with Putin, and was therefore not offered any clear guarantees or proposals. Importantly, this happened at a time when dramatic deterioration of the global markets reached Russia. This points to a premeditated approach to Kudrin's resignation. Putin could sacrifice Kudrin only if the decision on the future policy had been made even though Kudrin did not fit into it. Some of Putin’s recent statements point to this possibility. Once rather cautious with regard to matters of the economy, he said at the United Russia convention that the economic growth rate should be accelerated to 6%-7%. He also said in a recent speech that it is not so much the figures that matter, as the quality of growth. The thing is, a growth of 6%-7% can hardly be achieved without inflating a new economic bubble, which means increased lending to banks and industry, stimulated consumption, large state orders and state investment. On the other hand, Putin’s speeches contain elements of a relatively liberal agenda in terms of stabilizing finances, such as increasing the property tax and stabilizing the pension system, which most likely means increasing the pension age. But proposing these changes would be futile without liberalizing the economy and restricting corruption. People will not accept this belt-tightening in that situation. Alexei Kudrin, had he stayed on as finance minister, would have been assigned the worst part in that unfavorable scenario. Does Kudrin have a political future? The answer largely depends on his ability to overcome the “finance minister syndrome.” As finance minister, he firmly and consistently advocated for the need to maintain macroeconomic stability and to balance the budget. Macroeconomic stability and a balanced budget are crucial elements that create conditions for economic growth without themselves being growth factors. Thus, macroeconomic stability cannot be a political project. Kudrin maintained financial stability despite a deteriorating business and investment climate, which predetermined the unbalanced growth of the Russian economy. This is why the results of his operation are contradictory: he performed well as a professional in charge of the stability of state finances, but he did not achieve the larger goal of the economic policy in a satisfactory manner. The question now is whether Kudrin can formulate the principles and goals of an alternative economic policy.